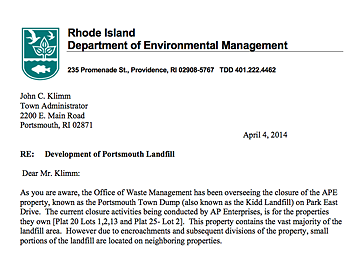 As reported last month, the RI Dept. of Environmental Management was alerted to development taking place on land adjacent to the site of the former Portsmouth landfill, currently being capped by AP Enterprise. Yesterday, they formally notified the town of their concerns in a letter sent to Town Administrator John Klimm, provided to harddeadlines by Mark Dennen of DEM. [W]e have been informed that properties on the corner of Highland, Pine and Russell Avenues that are currently undeveloped, are being developed. As stated previously, investigations have not been done on these properties so the extent and nature of fill are not known. However, investigations on the APE property have shown exceedences of both residential and industrial/commercial standards for metals, semi-volatile organic compounds and volatile organic compounds. We do not have any reason to believe landfill material on these properties is significantly different from landfill material on the APE property. We realize that permitting of the construction of buildings and roads is clearly within the Town’s jurisdictions, any activities on the landfill itself, or impacting previously deposited waste, will require advanced approval from the DEM Office of Waste Management before construction activities take place. "Transparency is the new objectivity"
If you're a fellow citizen journalist, please consider supporting the Online News Association. On June 5, 2007, I was barred from a meeting of the PCC. After waiting 64 days, I was rejected by a secret ballot. Could it have been something I said?